When offered a box of Bluebasil Gourmet Brownies to review, I was not going to refuse. I’d been eyeing these up ever since I first heard about them via Twitter. 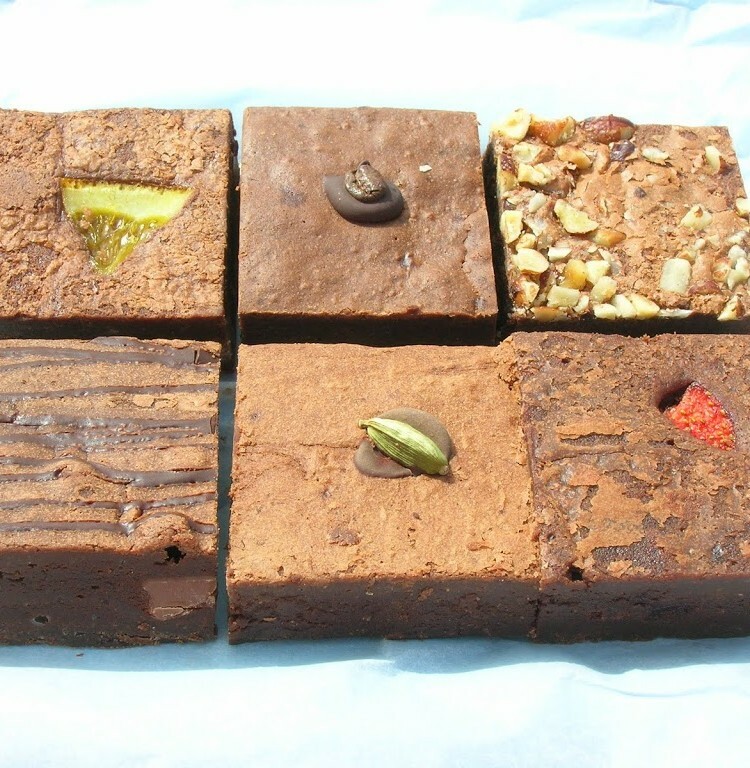 They are a small company specialising in hand made brownies using good quality ingredients. Sending brownies in the post must be a difficult undertaking I thought; I was wondering in what state these would arrive. I had no cause for concern: they were well packaged to avoid all the bumps and drops that are inevitable in the postal system. They were most beautifully presented with full eco credentials using a cardboard box, shredded paper, greaseproof paper for wrapping the brownies and tissue paper for presentation. I was impressed. When I got to look at the list of ingredients, I was impressed again. There was nothing there that I could take issue with – all the ingredients are of high quality with both the flour and eggs being local and organic (and of course free range) as well as local butter. Divine fair trade chocolate is used in some of the products, but it’s not clear what chocolate is used in the others. On unwrapping the box of six brownies of varying flavours, I first got a wonderful scent of chocolate and cardamom. I then got a feast for the eyes and I immediately started salivating. As ever, patience was needed and I had to take the all important photographs before I could tuck in. At last they were mine! I was a little concerned that the cardamom flavour would have leaked into the other brownies, but no it hadn’t. They all had their own unique flavours and most were easy to spot as they had an identifying ingredient attractively embedded on the top. I did have difficulty identifying the chunky white chocolate one I was expecting, but I think there was a mix up as what I seemed to have instead was a very nutty one. Cardamom – I had to start with this one as cardamom and chocolate are one of my favourite combinations. This is an award winning gold star brownie and I was not disappointed. This had just the right amount of cardamom, most definitely there, but not at all overwhelming. Best described as smoothly fudgy. Summerberry – Definitely fruity. I could tell that real fruit was used here as the seeds kept sticking in my teeth. I could identify blackberries and thought I tasted raspberries and strawberries too. These tasted fantastic, but I wasn’t too keen on the seeds. Chocwork Orange – a lovely natural orange flavour which in no way reminded me of a Terry’s chocolate orange – something I used to love in my younger days, but which now tastes too sweet and artificial. The piece of baked orange on the top was a delight. Hazelnut – Topped with roasted hazelnuts and a few scattered through the brownie, these were a crunchy delight. A lovely contrast of textures, the chewiness provided by the nuts allowed me to savour the flavours that much longer. Classic Chunky Chocolate – a classic brownie with no additional flavourings other than large chunks of milk chocolate, which give a very different consistency from the fudgines of the brownies when bitten into. I detected a very faint trace of something sweetly spicy, so it may have picked up a little of the cardamom and possibly orange flavours. This one used Divine milk chocolate. Cappuccino – not being too fond of coffee, I left CT to savour this one all on his own (apart from a very small nibble); he only got a partial look in on one of the others! He thought it packed a caffeine punch, but in a nice way. Its strong, robust flavour made him salivate and he thought it would be a good pick me up. Better than a cup of coffee he opined, plus it doesn’t have the annoying froth. CT is not a coffee sophisticate, but he really enjoyed this brownie. Other flavours include: Tiramisu, Banoffee and Chunky White Chocolate and specials are offered through the year. Both the chunky chocolate and the chunky white chocolate varieties can also be ordered gluten-free. They look really good. Brownies through the post – sounds like a very good idea indeed. WOW! What a great booty of choccie delights, I am sold! How wonderful! I still haven’t tried chocolate with cardamom but I really want to. I love the idea of tiramisu brownies… maybe I will have to experiment with that idea in the future. If only there was more time in the world! Great review choclette! They all look so pretty too. Did you consume the lot in one review!? My teeth hurt at the thought! love the play on words too. Brownies in the post? You have a hard life, don’t you?! My husband just looked over my shoulder at these brownies and said ‘they look nice’ hee hee. They certainly do. I had to laugh at the seeds in your teeth, sorry! Rather wishing I had one or two to try now – the house is currently bereft of goodies! These look so yummy. The different flavours will make them stand out from normal brownies ! These look lovely! Thanks for the great review! Love brownies! I’m bookmarking this page, they certainly do look like great gifts. Yes, they do look fabulous, and interesting! They do look very nice… and a great gift idea to boot! I was given a box of blue basil brownies as a gift. They came in a lovely gift box and taste absolutely divine. I will be buying these as gifts as they are the perfect present – especially for people you don’t know what to get. Amazing quality and very tasty.